The one piece of equipment you use for every single golf shot, no matter how near or far to the pin, is the golf ball. That’s why choosing the right ball for your game is crucial to your success on the course. At WGS, they offer top rated golf balls to suit every style of game. They have golf balls for the high handicap weekend golfer to the scratch golfer. A feature growing in popularity is personalizing your golf ball. Carefully selecting a golf ball to match your game will contribute to the consistent results you’re looking for. Tour proven golf balls are specially created to maximize high swing speeds. They also offer increased distance and spin control. When a PGA tour player reaches for a golf ball, you can be sure it will be from the Tour line. Likewise, premium performance golf balls are ideal for average golfers with moderate swing speeds. These players still want many of the popular technologies found in the Tour balls. Value golf balls are great for beginners. Ladies should consider specially made women’s golf balls. These balls are generally two piece, surlyn covered balls that produce longer distances. Personalized golf balls make great gifts. Add a name, initials, monogram, nickname, favorite saying to your favorite brand to create your very own customized golf ball. TaylorMade TP5 and TP5x – Experience enhanced distance, spin and control with the latest five-layer ball from TaylorMade. Callaway Chrome Soft – Get more spin and increased distance off the tee. You’ll get less spin and added control around the greens. Titleist Pro V1 and Pro V1x – Played by two out of three professionals on Tour, the Pro V1 and Pro V1x are built for max distance and incredible green side control. Buying Tip: Look for a ball with the right compression. Golf balls with a 90 or more compression create less spin off the tee, providing further distance. Golf balls with a 70-80 compression offer more spin with low irons and wedges. They deliver better stopping ability on the green too. Two piece golf balls are commonly viewed as the best fit for novice or high-handicap golfers. The larger core construction maximizes distance while minimizing spin. This leads to longer shots with greater accuracy. Also, if the golfer hits a wayward shot, a thicker cover construction allows for greater durability. Taking the core and cover constructions into account, two piece golf balls are ideal for golfers with lower swing speeds. This occurs because of the added distance, penetrating trajectory and reduced side spin they offer. Which Golf Balls Are Best For Mid-To-Low Handicappers? Multi-layer golf balls are designed for experienced, mid to low handicap golfers in mind. The series of core/mantle layers elevate control and feel. This allows golfers to sculpt shots and generate shot stopping spin command around the green. A characteristically thinner cover construction further enhances spin control. It also provides the soft, crisp feel serious golfers demand. The levels of control and performance golfers can achieve with multi-layer golf balls make them very popular. This is true for those players who have faster swing speeds and more consistent swing characteristics. Mid handicapped and high handicapped golfers should look to spend less than $30 per dozen for golf balls. Good golf balls in this range are the Titleist NXT Tour, Calloway Supersoft, and the TaylorMade Project (a) or Project (s) to just name a few. Personally, I recommend buying a sleeve of 3 golf balls of any brand first to see how they perform. If they perform to your liking, then invest in purchasing a dozen or more. What Is Core Compression And How Does It Affect Golf Ball Performance? Core compression refers to the overall density of the golf ball. Golf balls with a low core compression rating—60 – 80—were originally designed for novice, junior, female and senior golfers. However, they are now gaining a following with more skilled golfers, as well. The low compression rating of these “soft” golf balls allows for more deformation of the golf ball at impact. This is true especially with metal woods and longer irons. This deformation of the golf ball reduces spin rates on low/mid lofted clubs. Altogether, it translates to straighter ball flight and more distance. When using short irons and wedges, contact between the golf ball and club face is prolonged. Thereby, resulting in a softer feel compared to higher compression golf balls. Higher compression golf balls—90 and above—are generally designed for more experienced golfers with more aggressive swing speeds. Since golf balls with higher compression rates are harder to deform and spend less time on the club face, golfers with faster swing speeds are able to achieve greater command and control over the golf ball. Differing dimple patterns and shapes can have a range of impacts on the way golf balls perform. Golf ball manufacturers are constantly testing and working to improve them. Varying dimple shapes, patterns and sizes affect distance. It also effects the stability with which the golf ball flies and spin rates on both full and partial shots. How Does Using A Damaged Or Scuffed Golf Ball Affect My Game? The cover layer of your golf ball is constructed to exact specifications to consistently perform a certain way. Scuffs, cuts or other damage to the exterior compromise those specifications and cause your golf ball to perform in a slightly unpredictable, unintended manner. Imperfections on the cover change the way air and drag interact with the golf ball. This ultimately leads to the loss of distance and accuracy. For instance, if some of the dimples are shallower than others because of a scuff mark, your shot could potentially end up anywhere from 3 – 5 yards offline and up to 6 yards shorter than your intended distance. It is important to monitor the condition of your golf ball during play to ensure it is performing to its peak potential. Premium, multi-layer golf balls commonly feature softer cover compounds, such as urethane. This material tends to resist cutting on poor club face contact. However, they are more susceptible to cutting when the ball comes in contact with harder surfaces like trees and cart paths. Two piece golf balls, or golf balls with lower core compression, commonly feature firmer cover compounds, such as ionomer. This material tends to be more durable and resists cuts on both poor strikes and contact with harder surfaces. Golf Ball Fitting – Is It Beneficial? Next time you visit your pro shop or golf equipment store, consider being fitted by a professional golf club fitter for the correct golf ball for your game. Carefully selecting a golf ball to match your swing speed will contribute to the consistent results you’re looking for on the course. 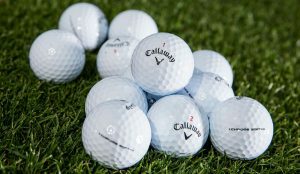 Interesting article on golf balls, I was amazed how many different types of golf balls you have to choose from. I seen on another golf website you can purchase personalized golf balls, I was just wondering by any chance do you have any of those golf balls? Jeff, Thanks for your comments. Yes WGS does provide an amazing assortment of golf balls for all skill levels. From the novice to the touring pro. WGS does have personalized golf balls on its website. Here is the link: https://www.worldwidegolfshops.com/Imprint-Golf-Balls/Search . I have used many different golf balls and personally I don’t have a preference. I love to try out new golf equipment when it comes out on the market. I like to keep up with the technology which is ever changing.